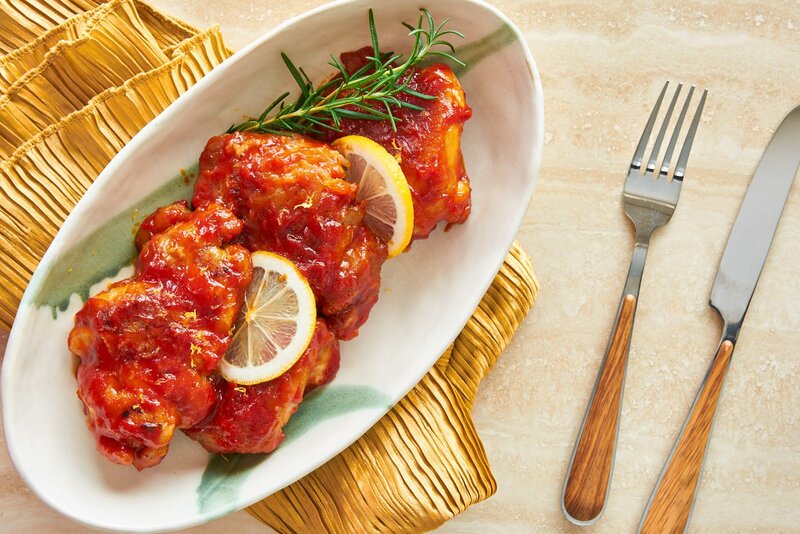 With tender, juicy chicken glazed in a tangy sweet sauce made from tomatoes, honey, lemon, and garlic, this Lemon Honey Chicken was a childhood favorite of mine. 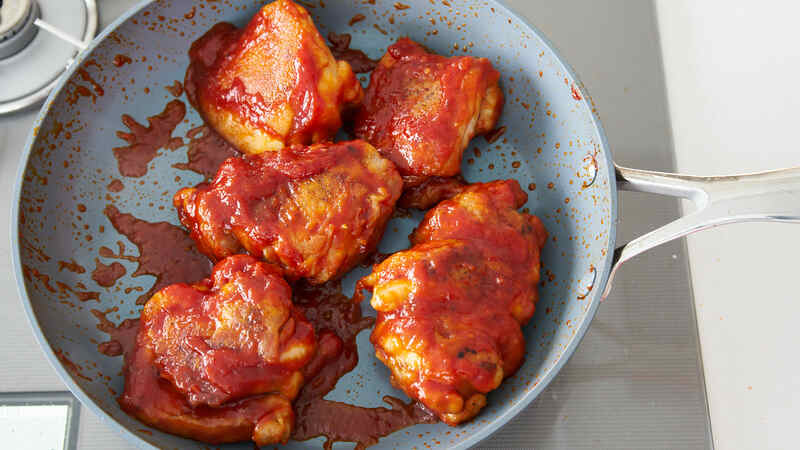 As a reflection of my multi-ethnic household growing up, this easy weeknight meal is like a mashup of Lemon Chicken, Chicken Cacciatore, and Barbecued Chicken. I’m not sure if this was something my mom came up with or a recipe she found along the way, but I haven’t seen anything similar elsewhere, and it’s a wonderfully simple yet flavorful dish that I wanted to share. 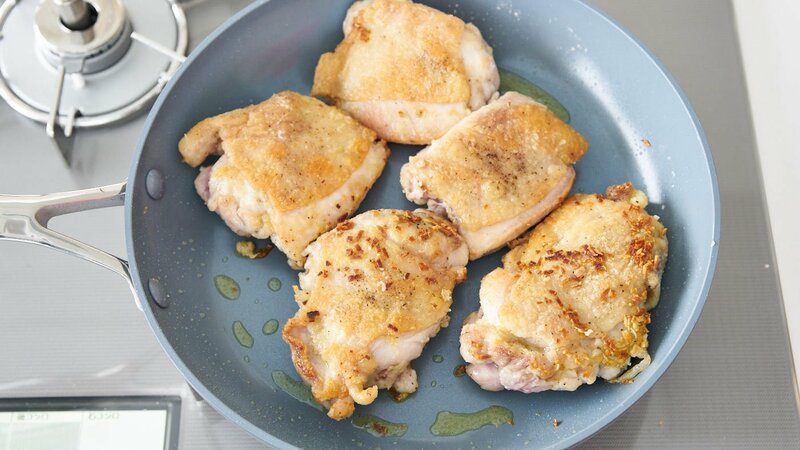 The chicken is seasoned and pan-fried with garlic before being coated in a sweet, tart sauce that’s loaded with mouth pleasing umami and the fresh zing of lemon. Served with rice and green veggies, it’s a quick meal that comes together in a matter of minutes, and yet it’s both comforting and satisfying. 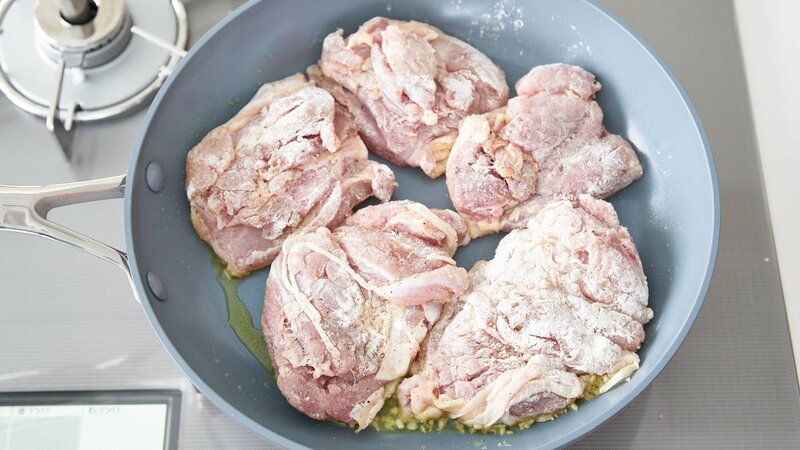 I like to use bone-in skin-on chicken thigh for this as the skin keeps the chicken moist while preventing the meat from getting tough as it pan-fries. If you’re not a fan of chicken skin, skinless thighs will work as well. As for breast meat, it’s tricky to ensure it’s cooked through, without drying it out, which is why I don’t recommend using it for this recipe. 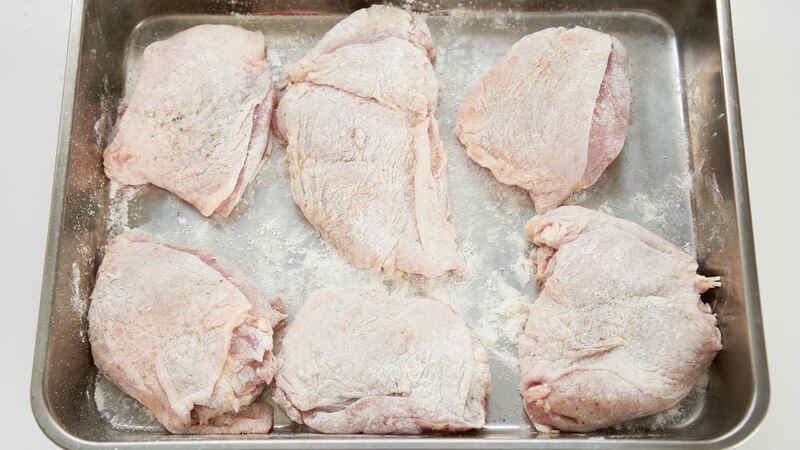 To prep the chicken I apply a generous sprinkle of salt and pepper to both sides. This ensures the chicken is well seasoned while providing a savory contrast to the tangy sweet glaze. Then, a light dusting of flour not only helps the chicken brown, but it also provides a surface for the honey lemon sauce to cling to. If you want to make this gluten-free, almost any flour (rice, chickpea, etc.) should do the trick. In my mom’s version of honey lemon chicken, she used a combination of ketchup, brown sugar and lemon juice for the sauce. It made for a sweet, sour and savory taste that’s like a lighter, fresher barbecue sauce. I’ve swapped out tomato paste for the ketchup, and honey for the brown sugar. The result is a more grown-up take on this childhood favorite that’s more tangy than sweet. 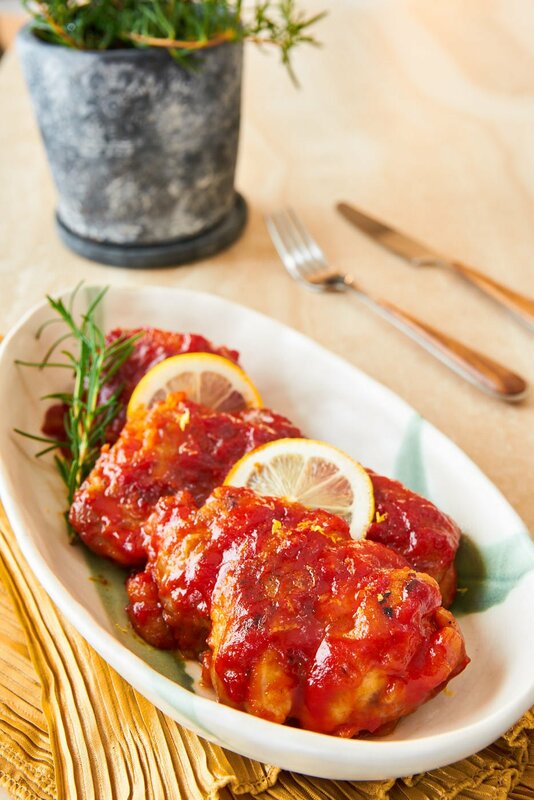 Using honey also retains the vibrant color of the tomato paste, while adding a glossy sheen to the glaze. I’ve also added some white wine to the sauce, which adds a bit more acidity along with some fruity notes that compliment the tomatoes and lemon. For seasonings, I went with simple to keep it close to mom’s recipe, but this can easily be embellished with herbs such as minced rosemary or basil. I also avoided adding any heat to keep it kid-friendly, but this is fantastic with a drizzle of your favorite hot sauce to turn it into chili lemon chicken. The cooking process is pretty straightforward with a quick pan-fry to brown the chicken, followed by a short braise in the sauce to cook the chicken through. I like to add the garlic to the pan at the same time as the chicken as it gives it a chance to caramelize while the chicken browns, without burning it. Once the chicken is browned on both sides, the sauce goes in, and the pan is covered for 7-8 minutes to ensure it’s cooked through. When the meat is done, I remove the lid and turn up the heat to reduce the sauce and caramelize it around the outside of the chicken. This produces a glaze that not only concentrates the flavors in the sauce, but it also gives the dish a stunning sheen. The final difference with my mom’s recipe is that I like to finish my Lemon Honey Chicken off with a sprinkle of lemon zest. Adding it at the end makes for a colorful garnish while preserving the fresh fragrance of the lemon, which you can enjoy with each bite. 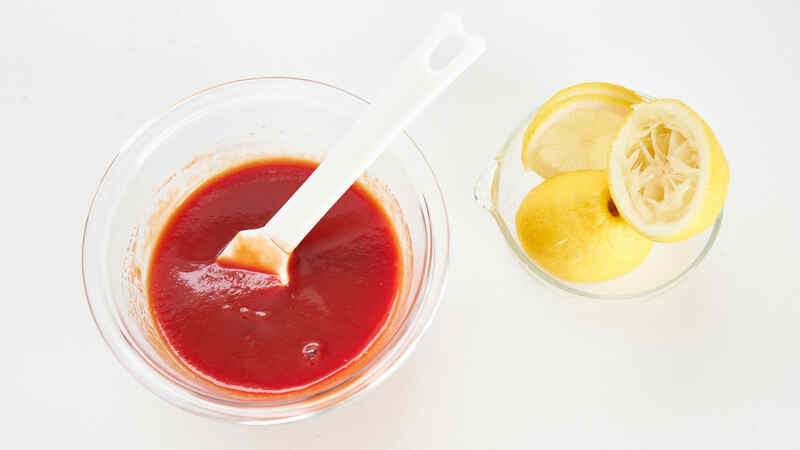 Whisk the white wine, tomato paste, honey, lemon juice, and salt together to make the sauce. Generously salt and pepper the chicken and then dust with the flour. Heat a frying pan over medium heat until hot, and then add the olive oil, garlic, and chicken skin-side down. Fry until the skin is golden brown and crisp. Flip and brown the other side. 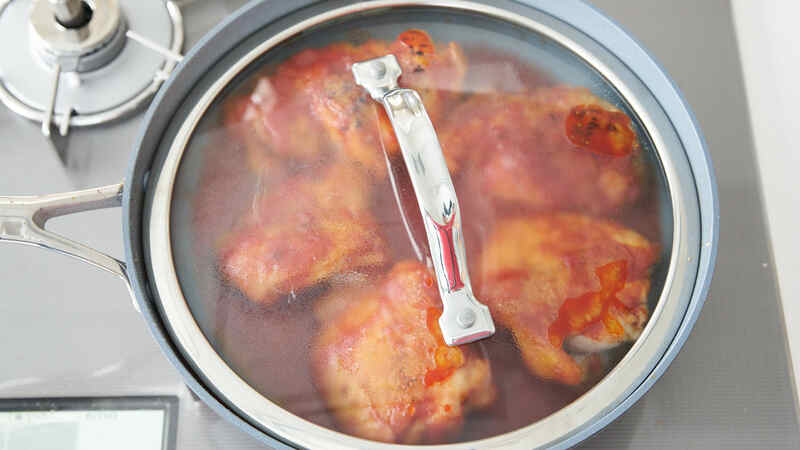 When the chicken is cooked, remove the lid and turn up the heat to reduce the sauce. Flip the chicken repeatedly until the sauce is caramelized around the outside of the chicken. Plate the chicken and zest some lemon zest on top to garnish.